A slicer is used to cut breads, pastries and various other items. Using knives correctly is very important. Without them, almost no task in the kitchen would be possible. It is important to know which knife to use for a given job, since using improper tools can make kitchen work extremely dangerous and incredibly difficult. In this blog we will discuss some basic knife types and their proper uses. The chef’s knife is the most versatile knife in the kitchen, and it can be used for slicing, chopping, mincing and most other knife skills. Its blade is broad and rigid, and it is usually between 8 and 12 inches long. The paring knife is used for more delicate tasks, such as coring strawberries, peeling vegetables and cutting the eyes from potatoes. It has a short, rigid blade, usually between 2 and 4 inches. The utility knife fills a gap between the chef’s knife and the paring knife. It is used for cutting fruit and vegetables and can be used in a similar manner as a small chef’s knife. Also, the utility knife can be used to trim meats. It is usually between 5 and 7 inches long. A slicer, sometimes called a bread knife, is used to cut breads and pastries, as well as for carving roasts and poultry items. 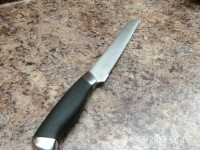 This knife is also handy for breaking down larger vegetables and fruits, such as melons and cabbages. It is often serrated and roughly the same length as a chef’s knife, sometimes longer. While not a knife, the honing steel is a very important tool. It is used to keep the other knives in good condition by honing them, or keeping the edge straight and smooth. Taking good care of knives is very important, and they should be hand-washed after each use and sharpened periodically on a whetstone. Remember, a dull knife is more dangerous than a sharp one because of the extra effort involved in using it. Also, only use your knives on cutting boards made of plastic and wood, as almost all other surfaces will ruin the edge regardless of how sharp the blade or how strong the steel.